"Get All The Support And Guidance You Need To Be A Success At Training Pets!" 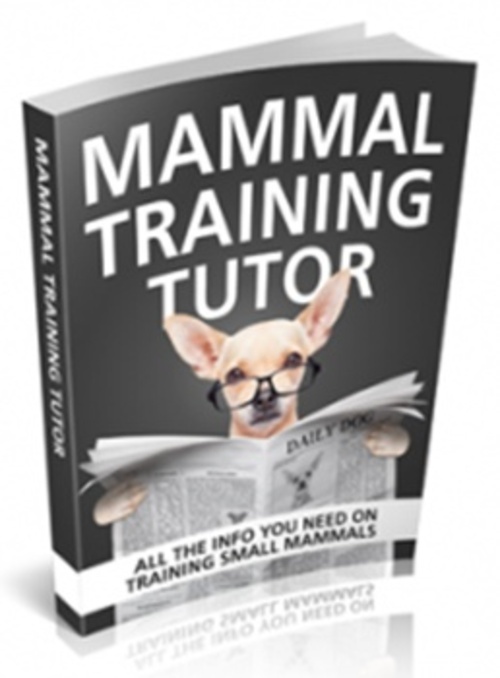 This Book Is One Of The Most Valuable Resources In The World When It Comes To All The Info You Need To Train Small Mammals! Is the fact that you would like to train yur small pets but just don't know how making your life difficult... maybe even miserable? Not knowing how to identify what to look out for. First, you are NOT alone! It may seem like it sometimes, but not knowing how to get started with training small animals is far more common than youd think. Owning a small mammal as a pet can come with its own set of benefits but it can also come with its own set of difficulties and headaches. Some small mammals can have some very bad habits. It will be the responsibility of you, the owner, to curve these habits and find ways to redirect them. Some of these habits may include not using a litter box or chewing on wiring around the house. It is important to train any pet so that it understands what is expected of it from its new family. However, it is especially important to train smaller mammals, even more so if you plan on letting them out of their cages from time to time. Smaller mammals can be trained, despite many peoples believes. A lot of people feel as if smaller mammals are too small to be intelligent and therefore they believe they cannot be trained. This is nonsense and do not be one of the people who believe this. Smaller mammals may be small but they are still living mammals so therefore they may be trained. It will take time and effort but it is possible. Your lack of knowledge in this area may not be your fault, but that doesnt mean that you shouldnt -- or cant -- do anything to find out everything you need to know to finally be a success! ... and thats not to mention the toll its taking on your personal life, like the way the failed attempts over and over can impact personal life/relationships. So today -- in the next FEW MINUTES, in fact -- were going to help you GET ON TRACK, and learn how you can quickly and easily get your small prt training under control... for GOOD! "This Book Below Will Show You Exactly What What You Need To Do To Finally Be A Success With Small Pet Training!" As a person just like you who has struggled with getting my pets under control, I have searched high and low to find the best strategies to fix this problem and I am fully qualified and equipped to help you put an end to your frustration with trying to wade through all the info you need to know to train a small mammal! There are different ways that you can train your small mammals and different animals may need different training approaches than others. It is important that you understand that the first method you try may not work. Do not give up hope and keep trying until you find something that works. Your hard work will surely pay in no time at all. This powerful tool will provide you with everything you need to know to be a success and achieve your goal of pet training to a successful place. With this product, and its great information on training small mammals it will walk you, step by step, through the exact process we developed to help people get all the info they need to be a success. tick What Equipment is needed? Don't let anything stand in the way between you and your success with your life and getting your pet training under control. Think about how much you could change your life if you really applied the strategies in this book. You could be a success in your pet training in a short period of time.